I've had my 4-channel mixer boards sitting around getting lonely ever since I released the VC mixer. People have been asking me for a preamp. By changing one resistor on this board, you can take the overall gain up to whatever you want. I modified mine for a gain of 2X. It has both a normal and an inverted output. It's a simple little board to build consisting of 7-100K resistors, 2-1K resistors, 2-2.2K resistors, 2-0.1uF caps and a TL074 quad op amp in a 14P DIP package. Typical input to output ratio is 1:1 using a 100K resistor for R9. Multiples of 100K multiply the output gain. I use 200K for R9 to give me up to 2X. 1M will provide 10X. It's top end is limited to a couple volts within the power rails. The panel pots are passive attenuators for the input signal and the amplifier gain remains constant. As you can see, it's a simple little device that can come in handy, be used as a mixer, an inverter, both, and/or a signal amplifier. I'm going to put the bare boards up for sale for $25.00 each. If you don't want to source the board components yourself, I'll throw them in a bag for $6.00. At least you don't have to pay shipping from a second source that way. I'll provide the necessary electrical components in the parts bag, along with all of the headers and an extra 200K resistor in case you want to use it for R9 instead of one of the 100K. You can decide if you want to mount the headers or, just solder your I/O directly to the board. I'll send them USPS priority mail for $4.95 domestic USA and $13.50 International. If people like this, I will do the same thing for the buffered multiple. It just uses 100K and 1K resistors, 2 caps and 3 TL074s. Another easy project. This is a MW only sale for you DIY guys and I'm confident from previous conversations with my MW customers that you guys are quite capable of handling soldering these on your own if you wish. Add up what you would like, figure out the proper shipping and PayPal me at mattsonminimodular (at) comcast (dot) net. 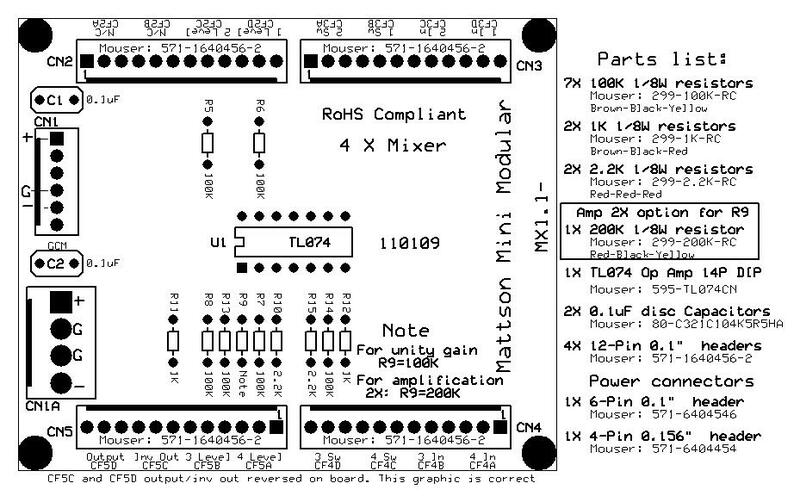 I guess we'll just call them mixer boards, mixer parts and wire kit 14B. I guess I'll run this until Midnight PDT Wednesday, August 25th.